D. Savannah is such a creative soul. 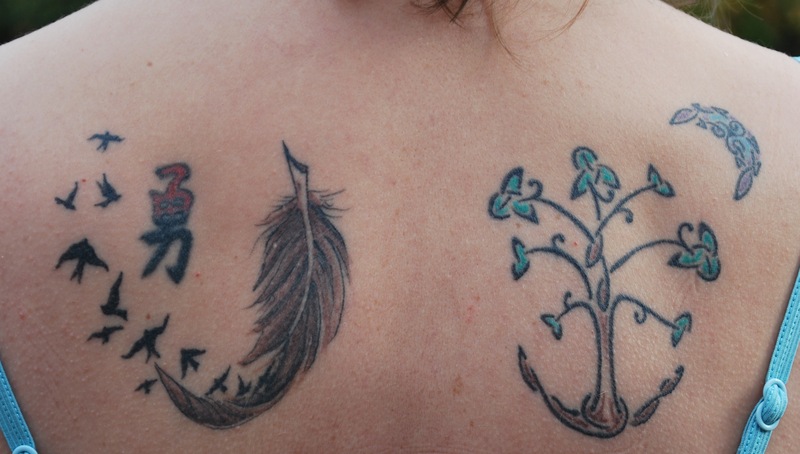 And, when she shared with me her tattoo story, I had to share it with you. Ironically, today is the anniversary of her marriage to her now ex-husband. Read on and experience the irony. Thanks for sharing D. Savannah. My (now ex-) husband had always wanted to get a tattoo, but his mother had been firmly against it. She even burst into tears at the sight of a fake, temporary tattoo he’d put on his arm or something. So, when he turned 30, he decided it was high time he got a tattoo, because, after all, 30 is practically grown-up, right? I had never had any interest in getting ink. I got my first while he got his first. His took 3o minutes. Mine took two and a half hours. I have seven (in order of getting them): wolf howling at the moon, Native American design, right stomach; Japanese Kanji for courage, left shoulder; turtle with the universe in its belly, right lower back; infinity symbol with a turtle, left hip; tree of life, right shoulder; feather with quill and birds, left shoulder (around kanji); “Open a vein”, right wrist. 4. What is your tattoo story? If you have more then one tattoo, tell me your most recent or your favorite tattoo. My favorite has got to be #6. My artist (who also did #5) free-handed it on my back, and it surrounds #2. It also feels the most “me” (whatever that means). I had no idea tattoos were so addicting! But I promised my (current) husband I’d stop at seven, so I guess I will. Like, obviously. Ironically, my ex-husband’s current wife has none, and my husband has none, and I’m pretty sure he just tolerates them on me. Also, my ex-husband only has three tattoos, while I have seven. The feather quill with the birds is absolutely beautiful. Thanks again D. for participating in Tattoo Tuesday. If you want to share your tattoo story. Let me know in the comments. I am loving that feather. It’s quite life-like. thanks for hosting me! 🙂 and thanks Aldrea! I don’t have any tattoos. Have nothing against them, just never found a design that screamed ‘me’. But I enjoy them on other people.